The Allen County-Scottsville Patriot golf team improved their nine-hole match play record to 9-0 this week with wins over Franklin-Simpson, Greenwood, and Barren County. For the ladies, scores are improving heading into the final three weeks of the regular season. 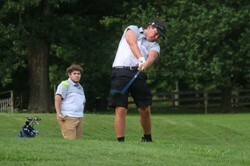 The Patriots recorded a team win last Monday at the Kenny Perry Country Creek Course in Franklin against the Wildcats. Junior Owen Stamper recorded a 30 with senior Brett Rippy and junior Bryson Bonds shooting rounds of 42. Senior Tate Stinson carded a 42 with sophomore Peyton Cline firing a 43. In a tri-match Thursday afternoon at the Scottsville Country Club, the Patriots posted a team score of 140, defeating Greenwood by eight strokes. Barren County finished with a 180. Bonds and Stamper posted rounds of 33---with Bonds’ score reflecting his best nine-hole round of the season. Stinson shot a 35, Rippy finished with a 30, with cline notching a 40. Lady Patriot freshman Alyson Miller and junior Amber Wimpee shared scoring honors for the team Tuesday at Franklin. Miller and Wimpee fired rounds of 46 while senior Hannah Beltz recorded a round of 48. In action Thursday against Bowling Green at the Paul Walker Golf Course, Beltz posted a 47, Miller carded a 48 while Emma Cline shot a 60. The Patriots and Lady Patriots are scheduled to face Warren East on Tuesday, September 4. On September 6, AC-S will host Monroe County at the Scottsville Country Club.